Attention to detail, productive systems and custom experience help The Joinery deliver high-quality furniture to its customers. 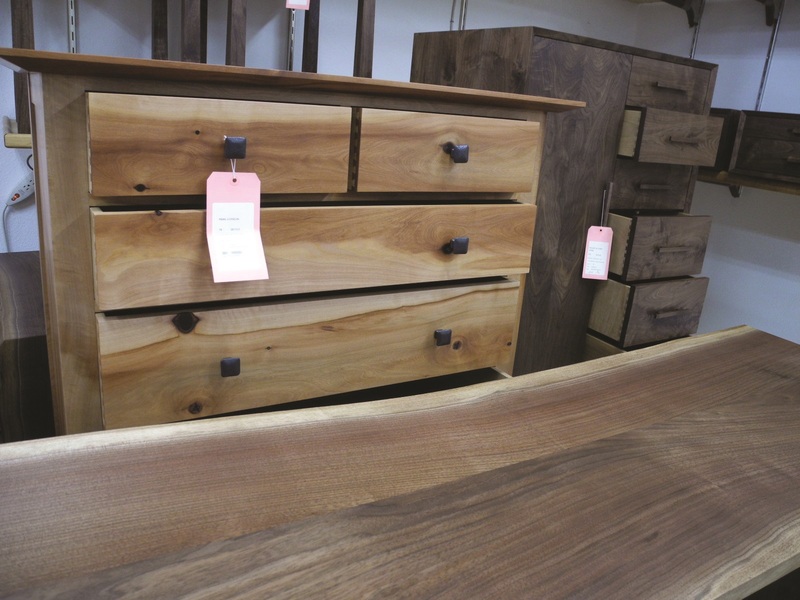 The company offers a lifetime warranty on residential furniture, and uses classic joinery construction techniques, sustainably harvested wood, and natural oil finishes. Each piece of furniture is signed by its builder. About 40 percent of furniture made is custom, and most work is residential, although the company has done office furniture, conference tables and other commercial work, most recently 15 large conference table for a Portland-based law firm and wood stools for Hilton Garden Inn chain. 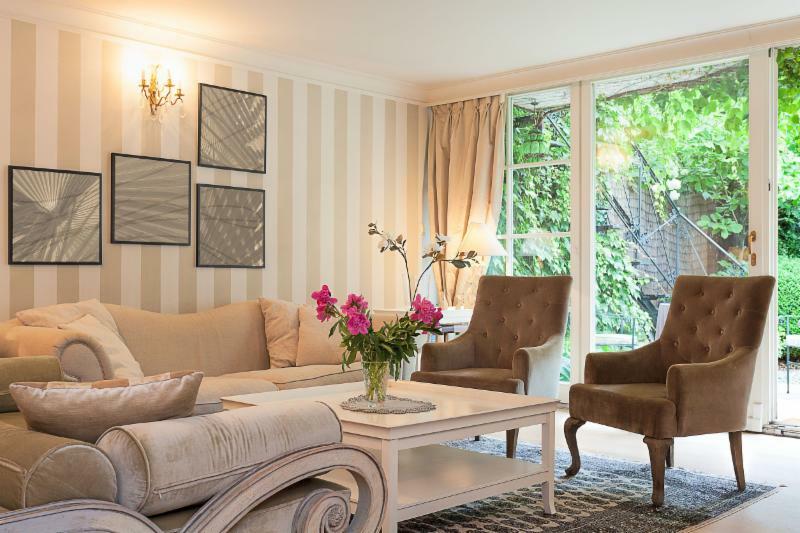 The company also produces several lines of solid wood furniture, over 200 standard products. 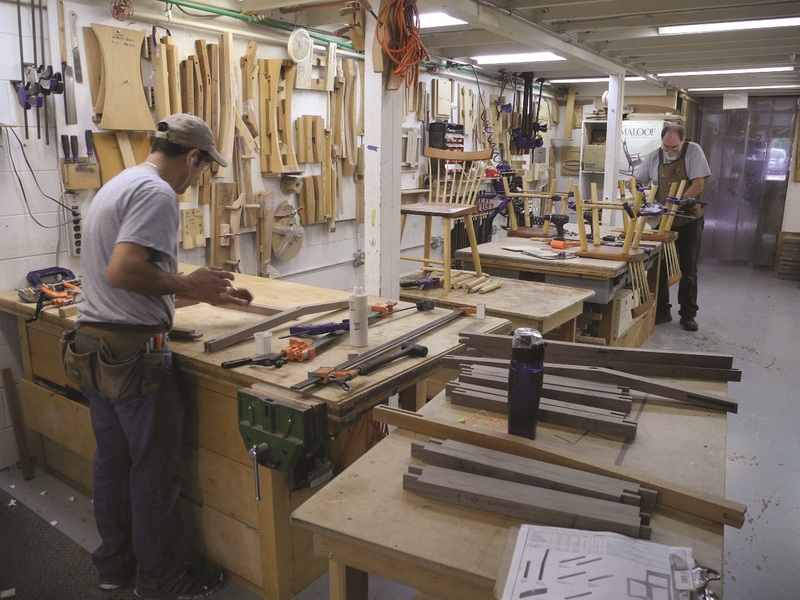 The Joinery has its 20,000 square foot shop and showroom in southeast Portland, Oregon, and maintains a showroom there and another in downtown Portland. The showrooms are an important part of the experience. People can come in and see finished furniture and work in process. The company has 33 employees, including 11 builders who work in the shop. The company has also implemented an ERP system (see accompanying story) to help them manage their own system more effectively. Cassandra Jackson, marketing manager, said that past jobs are used to quote future material. Salespeople have a good idea of the production process, so they can guide customers to match capabilities that the company has. It usually all goes to the designer, who develops the custom quote sheet. She will help find the right design and can make a rendering can be made using the AutoCAD Inventor program. “Each line we feature has different characteristics in the construction style, joint details, knobs, and top details,” Jackson said. “For example, the Corbett Case line features a false front that is faceted, a mitered case, an applied base and a cast pull that mimics the faceted detail. This line is currently just for dressers and nightstands as it is specific to a case construction, however it pairs beautifully with the Contemporary Sleigh bed with a tapered leg and focus on beautiful large panels of wood grain horizontally oriented. Dining tables and beds are big sellers, also dressers, nightstands and end tables. The Joinery’s product is almost all solid wood, other than some plywood panels, backs of cases and drawer bottoms. “If we can do it in solid, we will,” Jackson said. The company primarily works with six species: FSC-certified cherry from Collins Companies, eastern maple, eastern walnut, local western walnut, local white oak and local madrone, not a common species but one that produces an attractive appearance. The company is using unique species with character in the grain, and more live edge furniture, including live edge walnut. “Live edge is going strong for us in all room sectors and commercial,” Jackson said. “We don’t do distressed. I feel that is slowing down a bit. Customers like the idea of reclaimed materials, but once they see the material or the styles that work well with it, they usually decide on one of our standards. Sustainability is carried out in several ways.The majority of the lumber used is locally sourced, is certified by the Forestry Stewardship Council or both. All scrap wood is recycled into new products or donated to area woodworking programs. 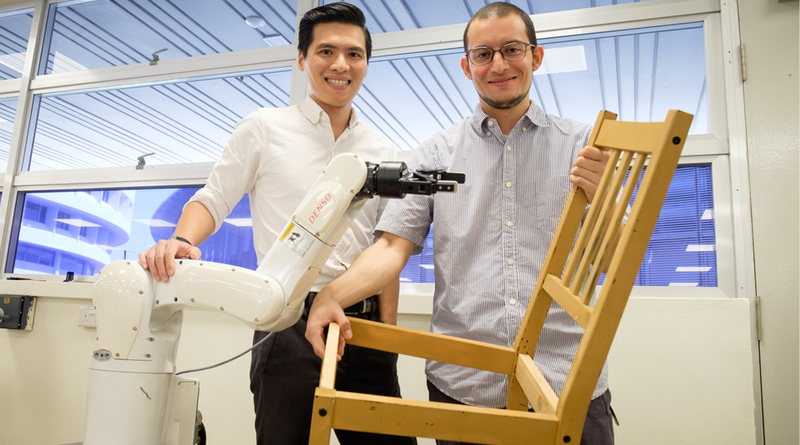 The company’s annual Metamortise Award recognizes the employee that best uses the company’s scrap wood to make the most innovative piece of furniture. The dust collection system feeds sawdust to an onsite compacting machine that turns it into wood briquettes, made available to anyone who wants to come by and take them for heating. The Joinery has solar panels on its manufacturing operation and purchases wind power credits for its remaining electricity needs. Its delivery truck runs on biofuel. It has installed high-efficiency lightning throughout its shop and showrooms. The Joinery also became a Certified B Corporation, which means that the company is evaluated by outsiders for its impact on the environment. Also, the company created a sustainability team to drive the next round of innovation in its product and processes. The company has been in its southeast Portland location on Woodstock Boulevard for 18 years. It has worked with the OMEP, the Oregon Manufacturing Extension Partnership, to make improvements in layout, flow and lean techniques. “We did work with them on evaluating the shop, process and flow,” Jackson said. 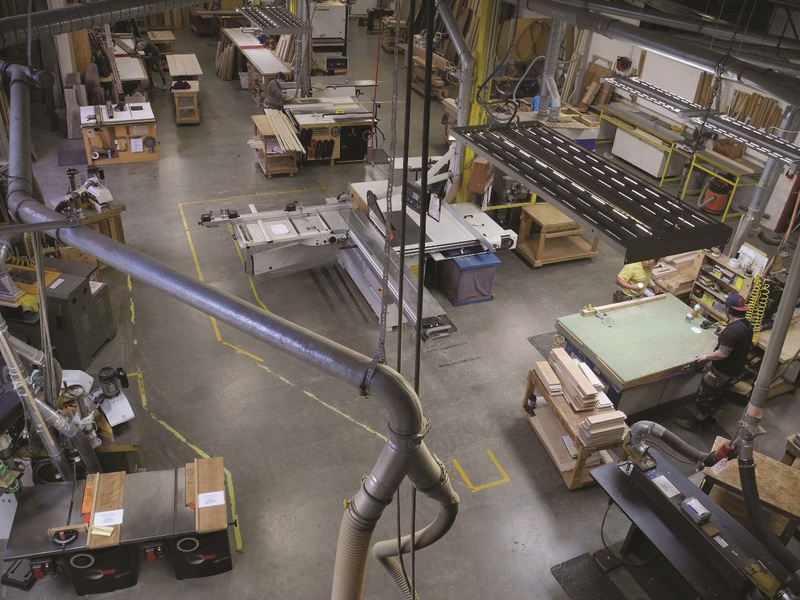 “They tracked a few projects through the woodshop to see if there are areas for improvement. There were many takeaways, especially on the sanding process. Certain (of our) builders sand in a certain way. We actually did videotapes of certain processes. Jackson said the company prefers to work with 4/4 to 10/4 lumber. They don’t want to have big thick solid pieces that can move or change over time. So, 5/4 and 6/4 are most common. A larger SCM sliding table saw is fairly new here. A Balestrini copy shaper and Ritter three-head shaper are used. A Balestrini (Pico) tenoner is used with TigerStop measurement, interesting because they’ve not gotten into CNC. Assembly is done in a separate room. Upstairs, a vacuum press makes curved pieces using four 1/8-inch thick pieces in a mold to produce a curve. For finishing, custom Sherwin-Williams tung-soy-linseed-citrus solvent finish is used, and may be applied two to four times, depending on end use. The company uses Howard feed–n-wax, which is also recommended to customers for later use. With a lifetime warranty, the furniture needs to be kept looking good. Implementing an enterprise resource planning system has proven to be a significant challenge for many companies. 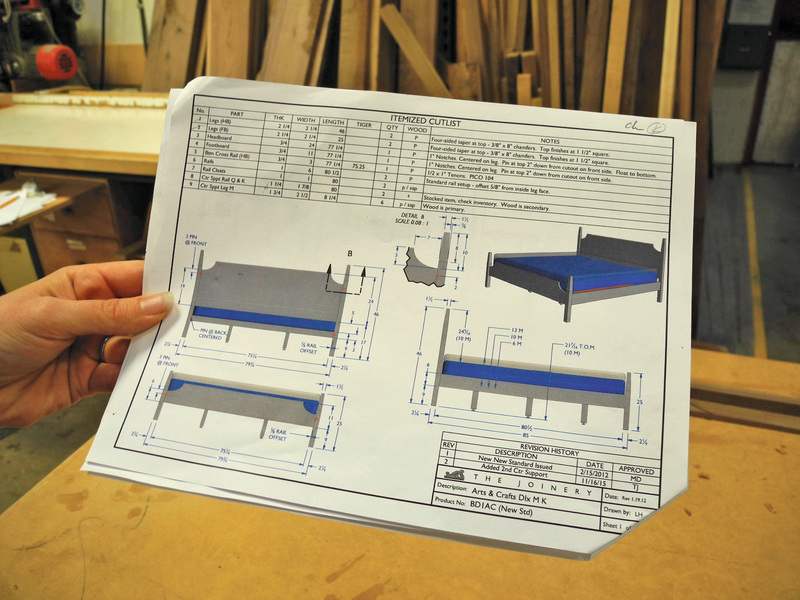 Rosy Boyer implemented the Global Shop Solutions system at The Joinery in 2012. “We implemented the ERP system to gain better insight into our costs and to improve overall visibility within all departments,” Cassandra Jackson said. “Before we implemented, we had a custom built Access database that was used to take sales orders and we used QuickBooks for accounting. We wanted to have one system that integrated information from all departments. Additionally, we needed to build up data so we could focus on ways to improve our productivity and really understand our margins. A cutlist is generated by the system automatically. The shop has been using an ERP system for several years. “A few of the biggest challenges in setting up the ERP system were finding a system that would work without much customization. We are a bit unique in that rather than having work stations worked by builders, we have builders that use all work stations. One builder takes a piece all the way through to our finish department. The system allows the company to track the job and see where it is in the shop in real time. The builders in the shop were more on board with switching over because it required less time for them to manually track their work. 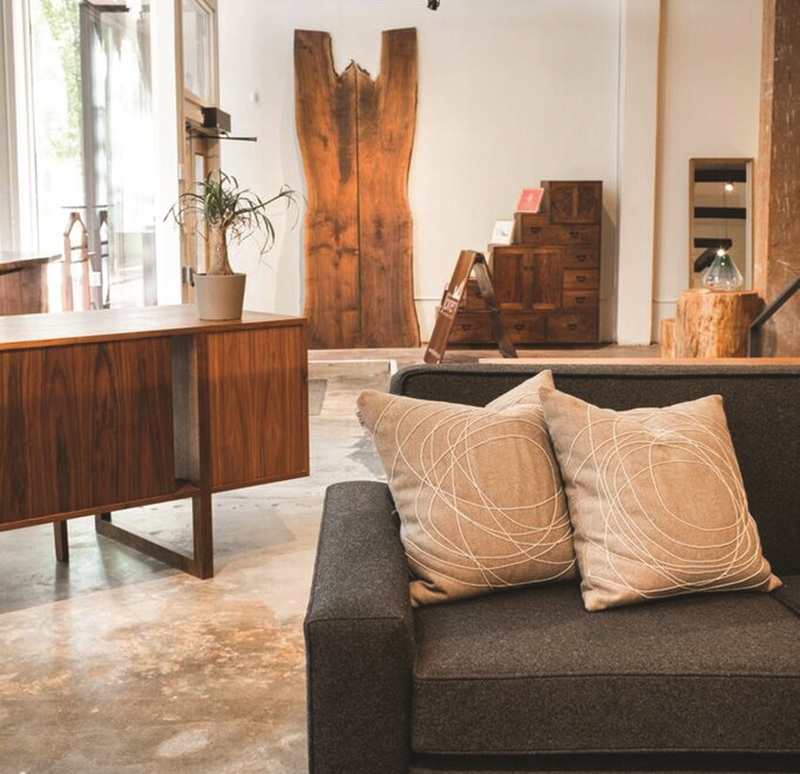 Portland’s maker of handcrafted, solid wood furniture, The Joinery, decided to transform its downtown Portland, Oregon, pop-up shop into a permanent showroom, and every square inch was considered. 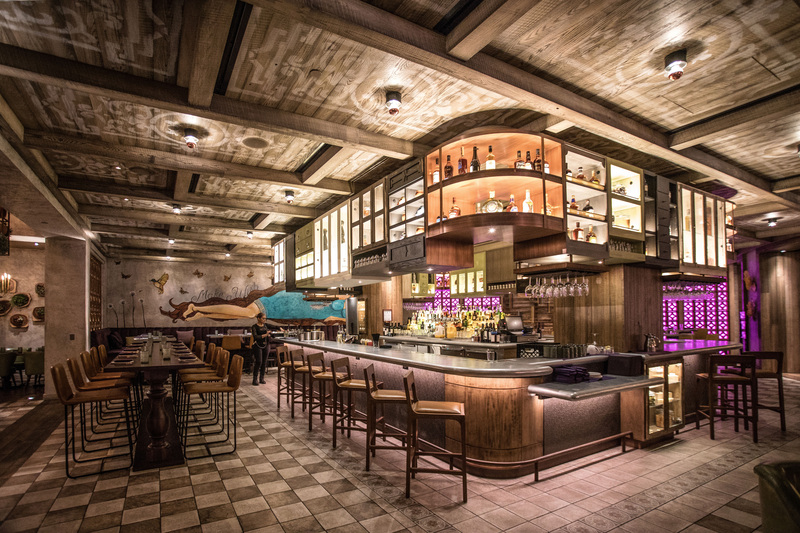 “We put an enormous amount of heart and planning into designing the space so that it would reflect what we do best, so that it would be a thoughtful representation of how we work,” said owner Jon Blumenauer. Krownlab’s Baldur hardware system, which handles the 150-pound slab while being ADA compliant. The live-edge door reflects the Joinery’s mission to create furniture that is as functional and durable as it is beautiful. Behind the door is a conference room that needs to be readily accessible throughout the day. 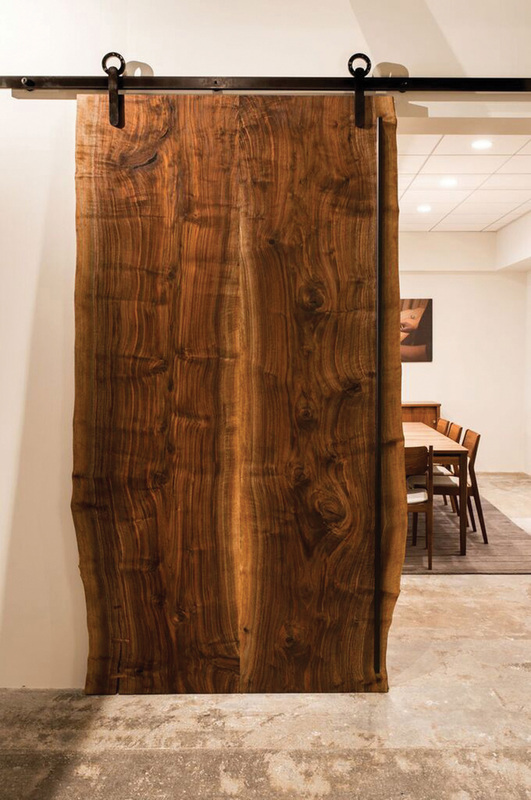 The live edge door is a statement piece in the showroom and attracts a lot of attention. Nearly every customer who comes in is drawn to its appearance and the practical way it functions. The Baldur sliding door hardware system has been tested through 130,000 cycles, the equivalent of 10 years of extremely high use. Krownlab is designed and manufactured only two miles from the showroom, helping reduce the carbon footprint further. See krownlab.com.